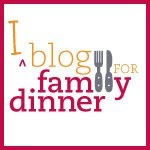 Here's a quick round-up of family dinner tips I found from other web sites. The writers include medical doctors, social scientists, and a pediatric nurse (who is also a feng-shui specialist). Make it a family priority. Sit at the table, not the kitchen counter, not in front of the TV. Parents signal the start and end of the meal. Keep conservation easy: no lectures or nagging. Family meals are for connection and communication. Healthy habits are easier to introduce at a family table. Don't let them "opt out" of dinner, even if they say they have homework. Set rules so the focus in on the table and talking, such as "no texting or taking cell phone calls" at dinner.